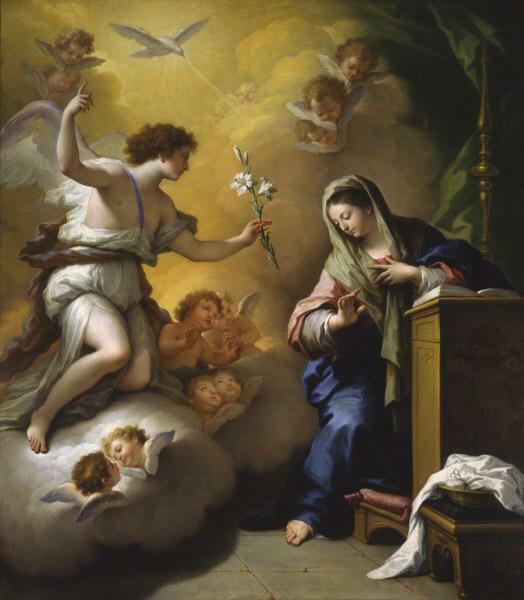 What is it about the Annunciation that is so captivating? Here’s a meditation on how the story of Gabriel’s visit to Mary can help us in our own relationship with God. The Annunciation depicts the dramatic entrance of the divine into our everyday world: God greets a young girl in her simple home in a small town. It also highlights the special role of women in the divine plan: Mary accomplishes something that certainly no man could do. Mary is someone whom many believers hope to emulate: humble, obedient, loving, trusting. But I think that the Annunciation draws me for a different reason. For it seemed that in this gospel story Mary wonderfully exemplifies the role of the real-life believer. To begin with, the initiative lies with God. It is God, through the angel Gabriel, who begins the dialogue with Mary. (“Hail, full of grace!”) As it is in our own lives. God begins the conversation. God speaks to us, and—as with Mary—often in unexpected ways. When Mary first experiences the presence of God, she is fearful or “perplexed,” as some translations would have it. How often this happens to us! Often we feel unworthy before the evidence of God’s love, since the presence of the divine illuminates our own humanity and finitude. Again, how similar to experiences in our own lives. As we reflect on our experience with God, it gradually becomes clearer what God is asking us to do. In other words, look around you. Look at what God can do, and has done in your life already. Mary does this in perfect freedom. As do we. With her yes, with her fiat, her “let it be,” Mary partners herself with the Almighty and is empowered to bring Christ into the world. With our own yes to God’s voice in our lives we are also asked to nurture the word of God within us and bring Christ into the world—certainly not in the same way that Mary was, but in our own situations. Using our own talents and graces we are called to bring Christ into the lives of others.